Title: BNSF 7297 2nd unit behind lead BNSF 7294 on the Z PTL-CHI. Title: BNSF 7297 with BNSF 7631 behind her waits to roll norht on Z PTL-CHI. Description: I tried to avoid the BNSF at all costs while down in Chicago, I get enough of their GEVo's and Dash 9's where I live. But, this was too photogenic to not get a shot of. Description: Burlington Northern Santa Fé. # 7297 eastbound after crossing White Rock Rd. 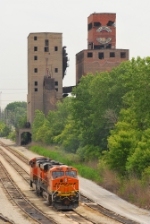 Title: The Trees echo BNSF's orange as another stack train pulls onto Main 2. Description: Westbound stack train winds its way through the "S" curve east of Yampai. Description: We get a big wave from the conductor on a stack train passing under the Santa Fe Signal Bridge at West Sibley on the BNSF Marceline Sub. Description: Q388 comes off the UP Connection onto CSX rails at Dolton. The reed grass isn't up over the handrails as it was in July. Title: BNSF races across the prairie. Title: BNSF 7297 4th unit out on this Sb grain train. Description: Sb grain train rolling past the Amtrak station.